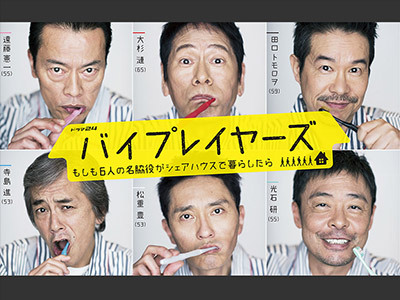 Six outstanding supporting actors (Endo Kenichi, Osugi Ren, Taguchi Tomorow, Terajima Susumu, Matsushige Yutaka, Mitsuishi Ken) receive offers from an overseas video distribution website for a large scale drama. An A-lister is playing the leading role and the director is also world famous. However, the director has a request. That is for them to live together for three months under the same roof to prepare for their roles and to bond. The circumstances are bewildering and they behave like junior high school students. But in truth, some project 10 years ago is the reason why they each have a lingering discomfort. Furthermore, there is a secret regarding this drama project �c �c Then, the supporting actors hear a rumour that the male lead has been dropped and this sets off ripples in the house they are sharing. The concept is great - six eternal support actors playing themselves, having to live together to prep for a movie - but it's not as funny and meta as I had hoped. Still it has its moments and it's one of the last appearances of Osugi Ren so it's definitely worth a watch. Interesting, the actors, even the guests, don't play roles, they're playing themselves. Had several laugh out loud moments. Good fun.